The Simone DeSousa Gallery opened an exhibition of work by James Collins on March 17, 2018, with a body of abstract paintings that exude both simplicity and complexity. A few of the paintings have an op art feel but not to their detriment, rather to their intrigue. 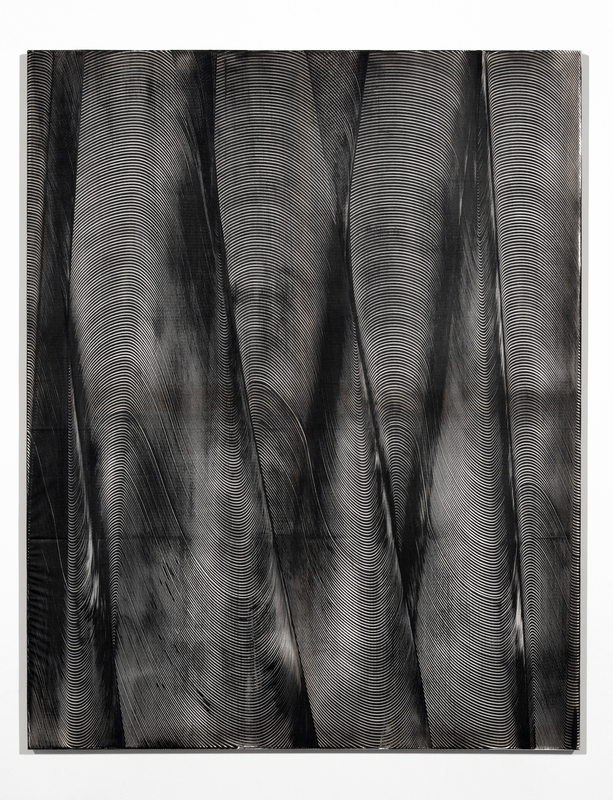 In these three paintings, Collins uses acrylic over a substrate made from clear vinyl shower curtains, and then uses a squeegee that he customizes from a rubber door sweep to apply the paint. He cuts notches in the rubber sweep that provide the line work he desires, using oil paint over the acrylic. He relies on the fact that oil and water do not mix. Therefore the oil and acrylic repel one another while still in their fluid state. It is a catalytic event as the different mediums repel each other momentarily. If the chemistry is off, and the painting does not work, it has to be destroyed, and he starts over. The extraordinary result is light, delicate and playful. What more could you ask for? In this 60 x 48” abstraction, the viewer can see the stretcher frame through the translucent shower curtain, but it is the dance with paint that draws us closer. It’s worth noting that these particular pieces leave us with an experience not well captured in an image, but come alive in person. In the gallery statement about Collins work, it says, “Detroit-based artist James Collins is known for minimalist op art and abstract works that are created through a variety of imaginative processes that embody chemistry and chance. These processes create a spacious and gestural sense of predictable unpredictability. In his multidimensional line-heavy chance-based works, Collins applies a custom process in which oil paint and water-based acrylic interact in a fluid state and repel each other. 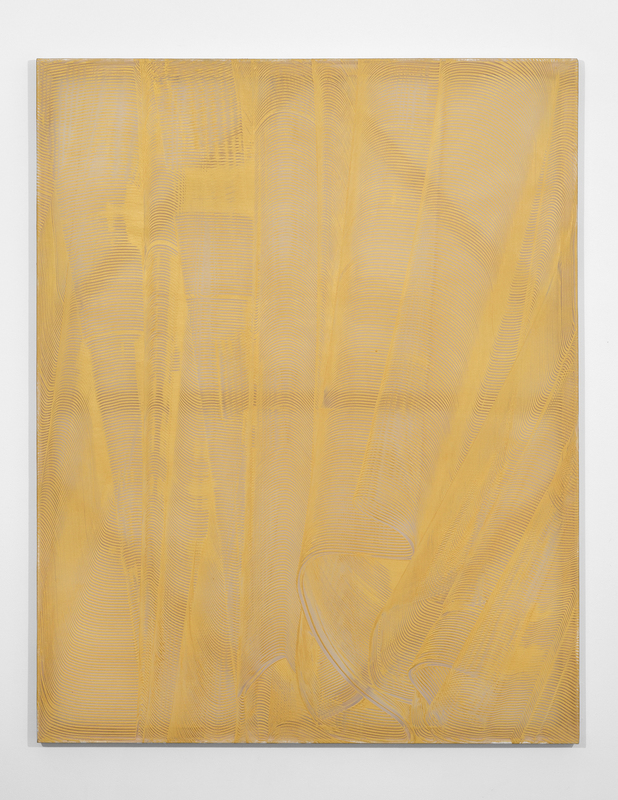 It’s the handling of and application of paint that conveys the spontaneity in Collins’ art. In this untitled orange-ish painting, the stretcher frame is even more exposed, intentionally. Each painting embodies an element of chance and little regarding the predetermined outcome. The artist’s goal is not solely to create new imagery but to coax the painting to life through the gestures in its making. In conversation, when I asked Collins about other artists he looks at with interest, he mentioned Bernard Frize, Wade Guyton and Jason Dodge. These square blue canvases are abstract fields of cloth imprints with oil paint. Each varies based on the type of rag or material used to create an impression. The consistent elements in these four paintings are the size and the color of paint, but the impressions are random patterns of folded cloth. James Collins grew up in Superior, Wisconsin and lived in Minneapolis before moving to Detroit six years ago. He lives and works in the Jefferson Chalmers neighborhood, on the canal. If you find Superior on a map, water and open space abound pretty much in all directions. How much of that early life determines the unconscious foundation in an abstract artist? I am not sure, but this work is original, powerful and refreshing. 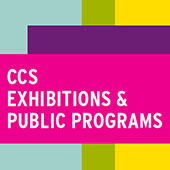 Collins has shown in a number of group exhibitions, including An Anonymous System at the Rogaland Kunstsenter in Stavanger Norway; A Painting Show at Simone DeSousa Gallery in Detroit; 99 cents or Less at the Museum of Contemporary Art Detroit; Summer Group Show and What Birds Can See at Document in Chicago, IL; New American Paintings at the Elmhurst Art Museum, Elmhurst, IL; On the Blue Shores of Silence at Tracy Williams Ltd., New York; FOG Design and Art with Jessica Silverman Gallery, San Francisco; Library Street Collective, Detroit; Urban Institute for Contemporary Arts, Grand Rapids, Mich. and at the West Michigan Area Show, Kalamazoo, where he was awarded the Grand Prize in 2012. Exploring the Tributaries, work by James Collins at the Simone DeSousa Gallery, runs through April 15, 2018.